Start Creating Your Mounted Print! If you want to display your photos just like the world’s leading photo art galleries, a Pixter Acrylic Print is the perfect choice. Acrylic mounting maximizes your photo’s clarity to create a dramatic look that’s both vivid and modern. The combination of super-vivid printing, professional-quality materials, and the depth and details of your photo creates a truly magical effect (ideal for photographs of water, metal or other reflective surfaces). One of the most popular ways to showcase your special life moments including your wedding day, precious baby photos or unforgettable travel experiences, acrylic photo mounts are a stunning way to display your treasured photos as sleek wall art. 1/4 inch clear acrylic is used in these types of prints. The print is mounted on the rear side of the acrylic allowing it to have a glass like finish on the front. Sintra is a rigid, durable, lightweight plastic ideal for mounting your favourite photos. Cut to any size or shape, sintra’s texture allows for museum-quality imaging and appearance, giving you the preference of mounting with or without framing. It’s light weight and portability translates to a simple installation; depending on its size, sintra can even be hung using sticky film! As durable as it is beautiful, sintra print mounts are a popular choice. Our mounted prints add a different look to custom prints. They can be mounted on a variety of substrates including Metal, Plastic, and Acrylic. Each substrate gives your print a different finish and overall look. 1/4 inch Plastic (Sintra) panels are used in the manufacturing of these type of prints. This lightweight yet durable plastic material is great for adding depth to photo quality prints hanging on a wall. Wire hanging is standard for most wall art. None of the hardware can be seen because it is all hidden behind the print. Canvases hung sit flush against the wall giving the art a clean and elegant look. Mounted Prints such as Acrylic, Sintra, and Metal are also hung this was except the finish look give the art a floating effect. This effect is very modern and looks great in any room. Stand-off Screws are gaining popularity today and give your art a unique look. The art is mounted to the wall with clean metal finished posts which go through the Acrylic, Metal, or Sintra print on the 4 corners. This unique looks has gained popularity in art galleries of the past few years. Depending on the finished look you are looking for in your décor. Our mounted prints are pretty light weight and can be adhered to the wall using very strong double sided adhesive tape. Your print would come with the tape pre mounted to the art and all you have to do is remove the paper tabs and stick the art right to the wall. This allows your mounted prints to sit flush against the wall. Black and white combined in continuum producing a range of shades of gray giving your photo a more subdued monochromatic character. Sepia tone is a reddish brown monochrome tint. When applied to your photo, it gives the picture a warm, antique feeling. Your image is broken up into small portions and the total visual impression is a composite of the various unit image. This gives your image a unique artistic look. Invert creates a negative of your image, in which the lightest areas of the photo appear darkest and the darkest areas appear lightest. The colors of your photo are also reversed into their respective complementary colors. The emboss effect gives your photo the appearance of being stamped or coated in metal. Pixelate enlarges the size of the pixels in your photo, giving it a retro 8-bit video game look. Blur will merge adjacent pixels giving your photo a softer look, this effect is great for hiding imperfections or de-pixelating images that are too small to print. How long does it take to you to create my print? 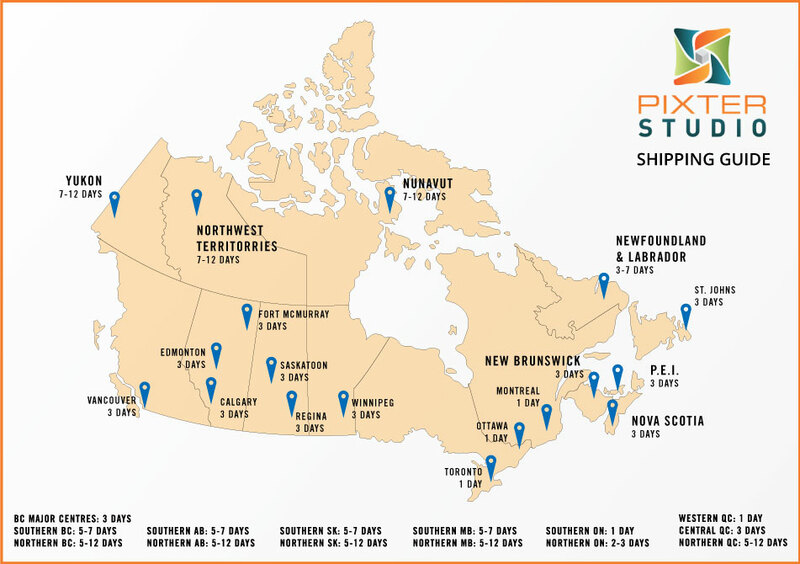 Production time varies depending on the type of print you ordered. The table below will give you an average production times for the various products we offer. It is important to note that these are just average times as each piece of art we create is custom ordered and unique. We do our very best to produce you art as fast as possible without sacrificing quality. Digital image quality is measured in PPI (Pixels per Square Inch). Without getting too technical; the lowest PPI you would want for large format printing is 72. Meaning that the minimum pixels your image has to be for a 12 inch photo is 72 x 12 = 864 pixels wide by 864 pixels tall. The more PPI an image has means it will look clearer and sharper. Our Image quality Rating System calculates the PPI of your image and gives you a rating based on the table to the right. When you upload the image it will give you the rating for the size chosen. Once you have resized and cropped the image it will give you a new rating based on the changes done to the picture. When an image is blown up it loses resolution. Which results in a lower PPI. If you have an image at 300 PPI and blow it up to be 2x the size its new PPI will be 150. This image would still look excellent when printed. Aspect ratio defines the relative size of height to the width of an image. 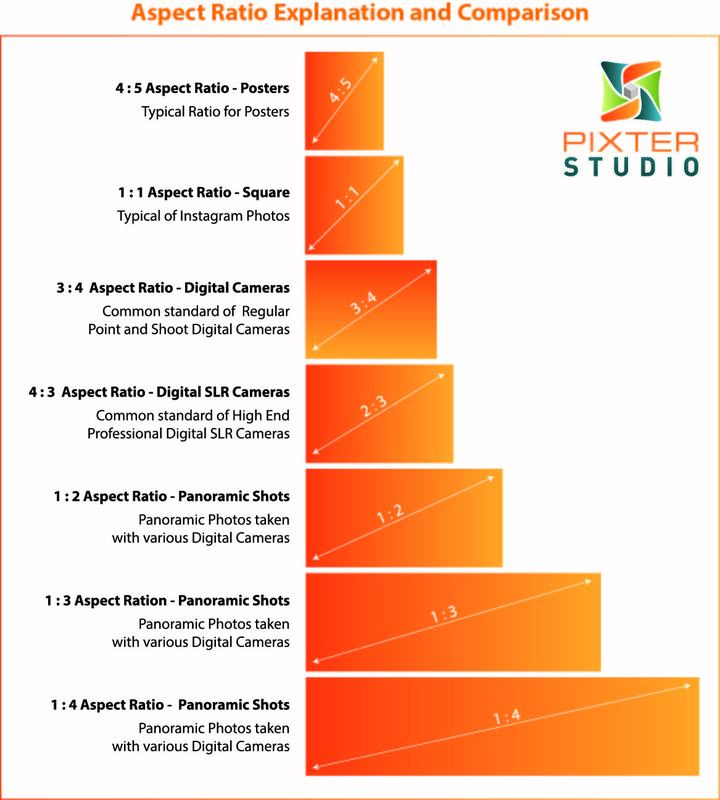 The table below describes which aspect ratios are best to select depending on how your photo was taken.